Or, He jammed the wheels of their chariots (see Samaritan Pentateuch, Septuagint & Syriac). In the passage above, it specifies the time this scene took place, “During the last watch of the night”. The term “watch” apparently comes from soldiers who were stationed to keep guard at night. They broke the time between the sun setting & the sun rising (12 hours) into 4 periods, or watches, each about 3 hours long. So the time this scene takes place is somewhere between 3 am & sun rise. The dim, blue light of the moon & stars lights this scene, with faint, pre-dawn yellow/white sunlight also dimly illuminating the scene from the right. Two Egyptian charioteers, amidst the tangle of their broken chariot, two horses & harness. Pharaoh (the king of Egypt) can just be seen in the background, falling out of his chariot, as his horses rear up in fright at the sight of the huge walls of sea water! A red fish can be seen on the exposed sea bed. 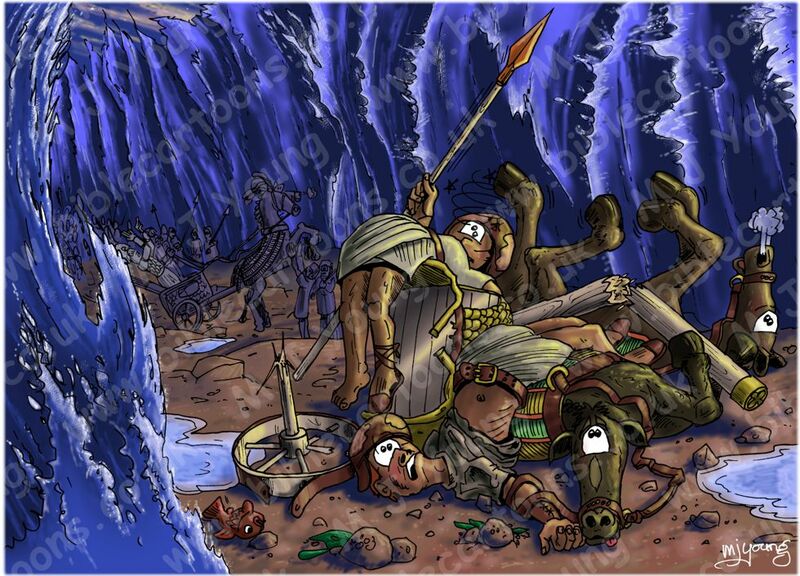 This scene uses all the colours & tones I’ve used in the previous scenes, to show the walls of sea water on either side of the Egyptian soldiers. At this point, they are not dead, merely stunned by the wheels coming off their chariots & the mayhem that must have ensued!